Bonmarche fashion store on April 23, 2013 in Bolton, UK. Clothes retailer Bonmarche exists since 1982 and has 380 stores in the UK. 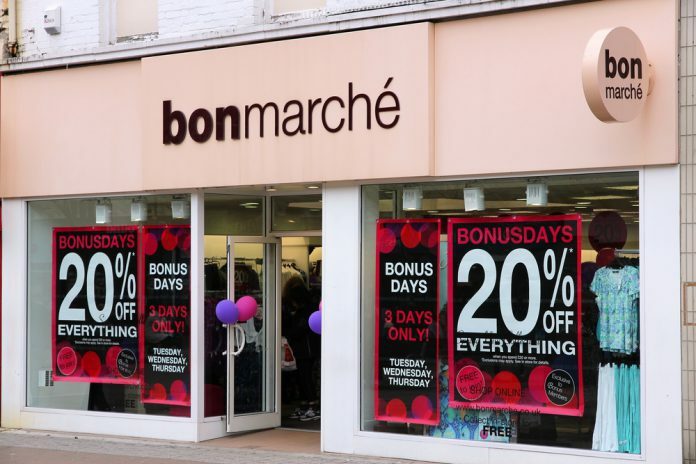 Budget fashion retailer Bonmarche (LON:BON) reported a 38 percent jump in profit, defying the recent high street gloom to post positive results. Profit before tax leapt by 38.1 percent in the year to March, hitting £8 million, despite a £4 million fall in revenue. The results were in line with expectations, boosted by strong online growth and tight control of gross margin and costs. Following the recent high street trend store like-for-like sales took a hit, falling by 4.5 percent, but online sales remained strong with a 34.5 percent rise. The retailer proposed to raise the final dividend to 5.25p per share, taking the total for the year up 8.5 percent to 7.75 pence. Bonmarche reported that trading had been better since the beginning of the new financial year than the second half of last year, but warned that conditions remained challenging. “We have made good progress in all areas, particularly online, where we have seen strong growth, whilst also making improvements through a number of other self-help initiatives including the product proposition, the loyalty scheme, and developing a more agile supply base,” said Helen Connolly, Chief Executive of Bonmarche. “Whilst we expect the market to remain difficult, trading since the beginning of the new financial year has been stronger than during H2 of FY18, and is in line with the Board’s expectations. We have a clear strategy in place to continue to improve our proposition, which we expect to do during FY19 and beyond”. Shares in Bonmarche are currently trading up 7.41 percent at 110.00 (1013GMT).